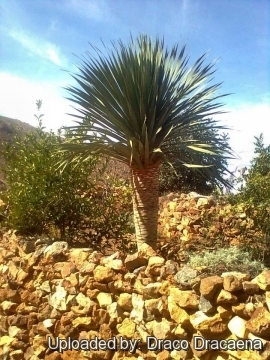 Origin and Habitat: Morocco. Western part of the Anti-Atlas mountains East of Tiznit. Type locality: Jbel Imzi, prope Anezi in Anti-Atlantis, 450 metres above sea level. Habitat: Grows on quartzite cliffs in gorges in dry mixed open woodland. 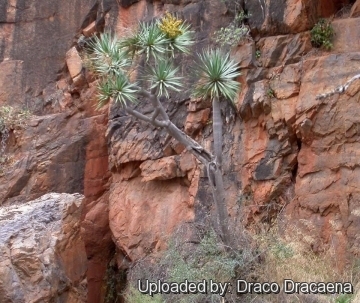 Brief history: The term “Dragon tree” is the common name given to certain trees or shrubby species of the genus Dracaena. 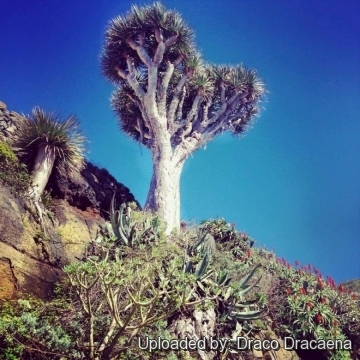 The most famous of the “Dragon trees” is the Dracaena draco that is the flagship species of the Canary, where it has almost disappeared natural environments. It is also present in Madeira and the Cape Verde Islands. 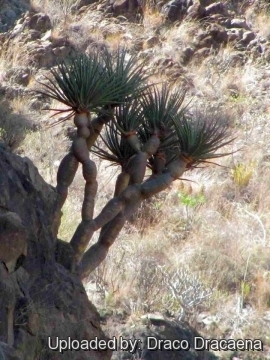 It was long thought that it was endemic to Macaronesia (Canary islands archipelago), until the discovery in 1996 of a wild population in the western part of the Moroccan Anti-Atlas, near Tiznit, now considered subspecies Dracaena draco subsp. ajgal. This species has an exceptional Longevity. There was in the garden of the maison Franchi in La Orotava in Tenerife a 5000 years old dragon tree which was destroyed by a hurricane in 1868. The age of this tree is today estimated at 600 years only. 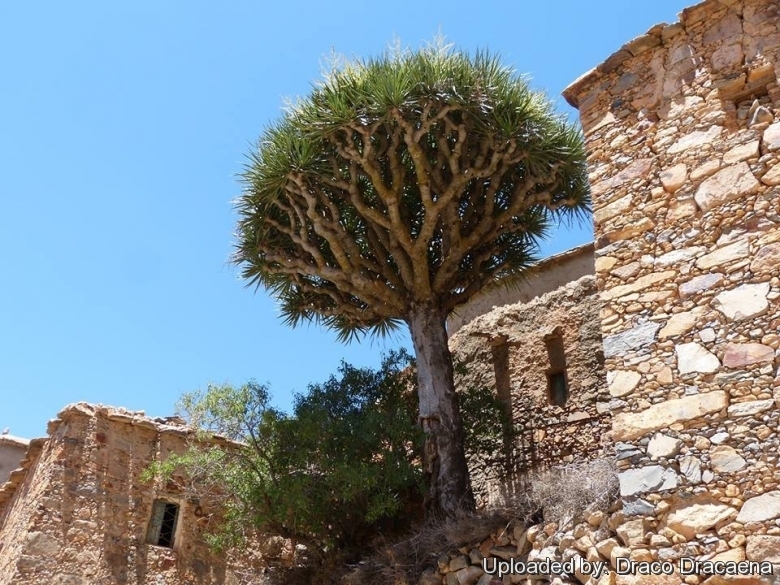 In 1996, a small wild population was rediscovered in the Moroccan High Atlas, near Agadir (Dracaena draco subsp. ajgal). 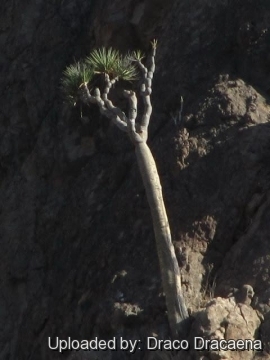 The plants grow on the mountainside, in the rocks, up to 1400 meters (Ajgal means "living in altitude," the "inaccessible" in Berber). 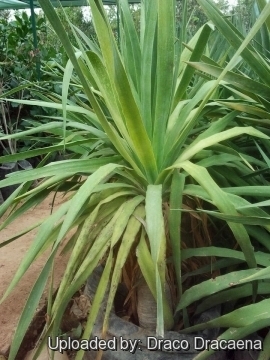 This subspecies is similar to the standard canary Dracaena draco, but differs slightly in shape and colour. 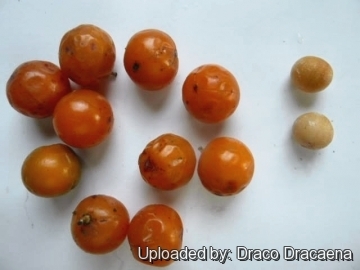 Description: Dracaena draco subs. ajgal differs from type for the smaller leaves and smaller flowers. For all other characteristics it is comparable to the type. Leaves: 60 cm long, 3 cm wide. Flowers: Pedicel 1-4 mm long, Perianth yellowish-white. Tube campanulate 1-2 mm long. Tepals 7-8 mm long. Anthers yellow. 2) Chase, M.W. ; Reveal, J.L. & Fay, M.F. (2009), "A subfamilial classification for the expanded asparagalean families Amaryllidaceae, Asparagaceae and Xanthorrhoeaceae" Botanical Journal of the Linnean Society 161 (2): 132–136. 4) Bañares, A. et al. (1998). 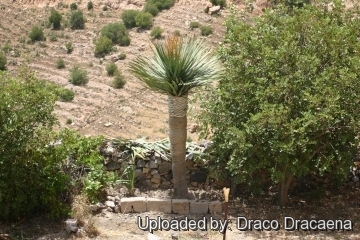 "Dracaena draco" 2006. "IUCN Red List of Threatened Species." IUCN 2006.